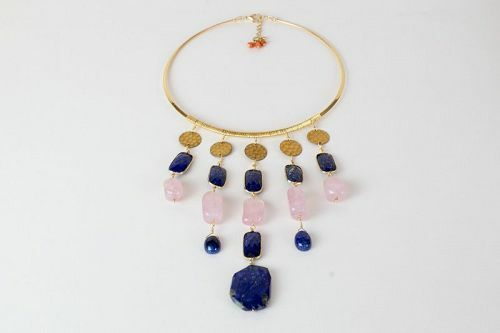 Specialty design of gilt brass neck ring necklace with hammered vintage brass discs, lapis lazuli beads and old irregular shaped rose quartz beads together with larger lapis lazuli from Afghanistan. Limited Edition. Each necklace is slightly different. Handmade in Austin, Texas. 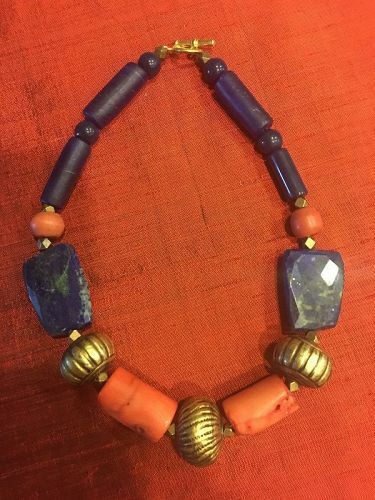 Gilt brass neck ring with vintage hammered brass discs resulting in an uneven surface, together with lapis beads and one old larger lapis pendant from Afghanistan. Jewelry with delicate and contemporary flair. Special designs in limited edition. 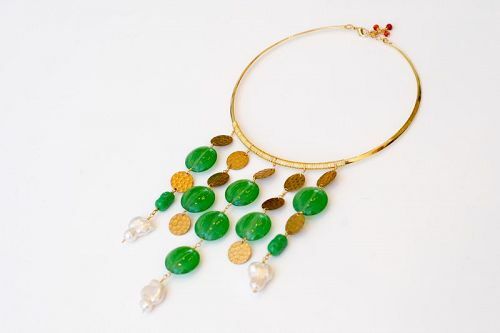 Gilt brass neck ring with vintage hammered brass discs, vintage green glass discs and irregular shaped pearls. Special design in limited edition. Each necklace is slightly different. Specially designed choker necklace. Each necklace is slightly different. Delicate yet striking. Limited Edition. Handmade in Austin, Texas. 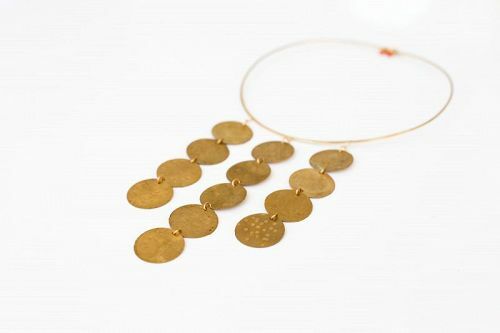 Gold plated brass wire neck ring designed with vintage irregular shaped brass discs. 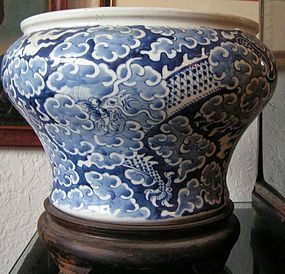 Made with impressed design motifs resulting in an uneven and patterned surface. Our necklaces are delicate yet striking with a contemporary flair! Each necklace is slightly and uniquely different. Handmade in Austin, Texas. Limited editions. Gold plated brass wire neck ring designed with vintage irregular shaped brass discs. 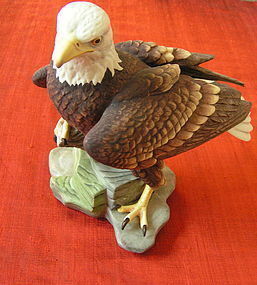 Handmade with hammered impressions resulting in an uneven surface. 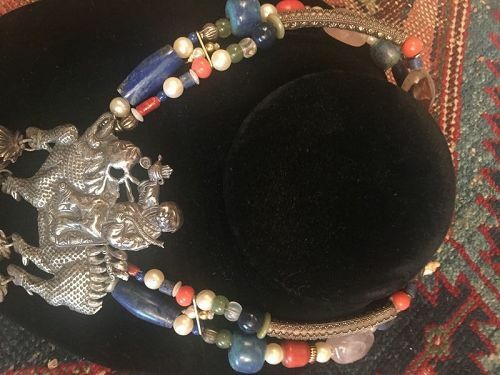 Each necklace is unique and may vary to a small extent from the image shown. Made in Austin, Texas. Limited Editions. Our necklaces are delicate yet striking with a contemporary flair. Gold plated brass wire neck ring designed with vintage irregular shaped brass discs. Made with hammered design resulting in an uneven and patterned surface. Our necklaces are delicate yet striking with a contemporary flair! 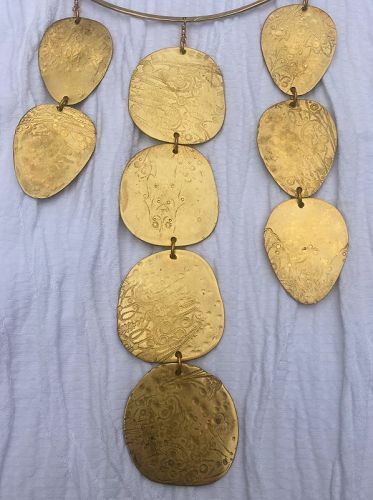 Each necklace is uniquely different. Handmade in Austin, Texas. Limited editions. 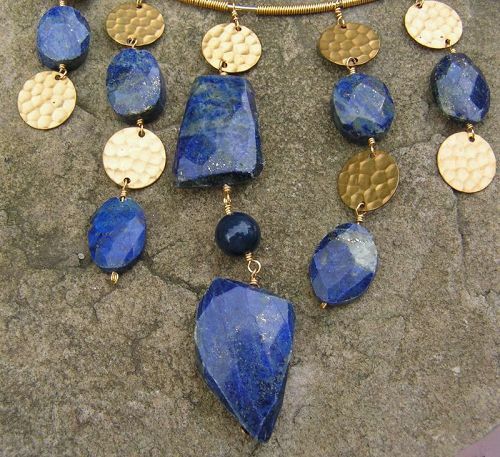 Lapis with sparse glitter of gold dust together with gilt Khmer silver beads. Vintage beads. We design each necklace with beads we have owned for many years and collected all over the world. 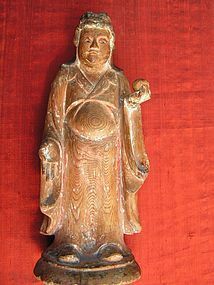 Well modeled, and with traces of gilt bronze the figure of a monk, perhaps a training monk - or Unsui, or if under ten years old, then called sami. 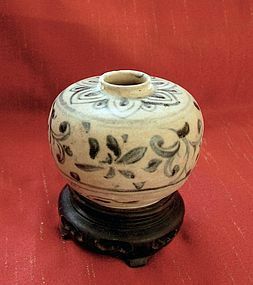 The piece was acquired in the early 1960's in Japan. Measurements: H 11". A fine carivng of a caparisoned horse with incised and raised motifs. 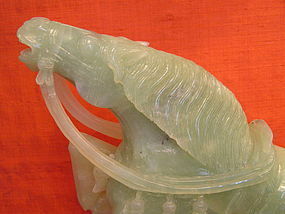 The horse is said to have come to the United States from China for the New York World Fair in 1939. With fitted rosewood stand. Measurements: H: 16" L: 23" D: 6" Weighs more than 40 pounds.